Compare Best Forged Kitchen Knives: Wüsthof or Zwilling J.A. Henckels? So you've got a great new kitchen which you want to equip with the best cooking equipment so you can cook like a chef. Among other things, a set of good kitchen knives is something you'd have to carefully consider. A lot of people rush into buying knives without any real knowledge of what sort of knives are necessary for successful cooking. They end up with low quality and inadequate knives they'll be stuck with for a very long time, limiting their abilities to cook like a chef. This review will first introduce you to the 7 basic knives that every kitchen should have. It will then compare two of the best forged knife brands to help you equip your kitchen with knives that will provide a lifetime of successful cooking. The knives that will be considered for comparison are the Wüsthof and the Zwilling J.A. Henckels German made forged knives. Kitchen knives are made of various materials, the most common ones being carbon steel, stainless steel, high carbon stainless steel, ceramic, and plastic. The best knives are forged knives made from high carbon stainless steel (basically stainless steel alloys with a certain amount of carbon). High carbon stainless steel blades combine the best attributes of carbon steel and ordinary stainless: they maintain a sharp edge much longer, and they do not discolor or stain. Forged knives are good examples of blacksmith art at work. Not only are they hand made, but many cycles of heating, cooling and hammering of the steel piece may be required to make a single knife. As a result, the steel is tempered making the knife strong and unbreakable. This is why forged knives are more expensive than ordinary knives. The best knives are also forged from a single piece of high carbon stainless steel that runs the entire length of the knife. That means the steel piece extends all the way into the handle (see picture). 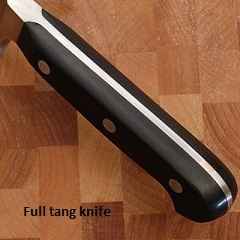 The part of steel piece inside the handle is known as the tang, and when it is extended all the way to the end of the handle, it's called a full tang. Remember, the best knives are full tang knives, as they provide strength, better control and better balance, and much longer durability. You will find below the list of 7 knife types that every well equipped kitchen and successful cook should have. This will be followed by a comparison of Wüsthof and Zwilling J.A. Henckels knives. Ideal for peeling potatoes, the peeling knife has a short blade and a small handle which allows working closer to the potato. The slightly curved blade fits perfectly the shape of the potato, and eases peeling tasks requiring some skill. Obviously, this knife can also be used to peel other vegetables and fruits, such as cucumbers, beats, apples, pears, etc. The boning knife has a narrow blade with a pointed tip and is ideal for separating the meat from bones. It has a thin and flexible blade, about 5 to 6 inches long, able to reach easily the bone of any cut without damaging the surrounding meat, and capable of getting into tiny spaces within the meat, which makes it ideal for preparing roasts and removing tendons. The carving knife is a large knife (between 8 and 15 inches) ideal for cutting very thin slices of almost anything, including poultry, roasts, and hams. The finely honed blade offers very little resistance, and is much thinner than a chef's knife, enabling it to carve thinner and more precise slices. With its serrated blade, the bread knife slices through the crust of any bread with ease without crushing the bread. It is not necessary to exert as much pressure as you would need when using a regular smooth knife. Bread knives are usually between 6 to 10 inches long. The asymmetrical blade provides a clean cut, which prevents the bread from drying out too quickly. There are two solutions for slicing tomatoes. Either with an extremely well sharpened knife, or a knife with a serrated blade. The tomato knife has a serrated blade that first cuts with ease through the tomato's firm skin, and then through the delicate flesh as if cutting through butter. It does not require to exert a lot of pressure. This knife, shorter than the bread knife, is also suitable for small breads and paninis. A utility knife usually measures between 4 and 6 inches. It can be used for all kind of small and intermediate tasks such as cutting and chopping vegetables and paring fruits. Some models come with serrated blades and can also slice beautifully tomatoes. The sharp point makes it ideal for small or intricate cutting chores. This is a very popular kitchen helper that carries its weight mostly in its extremely comfortable handle, which allows you greater control. The chef's knife also known as the cook's knife is designed to perform a multitude of kitchen tasks, rather than specializing at any one in particular. It can be used for slicing, chopping, mincing, etc. vegetables as well as meats. Clearly, one can save a lot of money by buying a good chef's knife instead of a number of specialized knives. But for certain tasks such as peeling, paring and boning, the specialized knives are better suited than the chef's knife. Also, it is good to have a chef's knife always available in case a second person might want to help you in the kitchen since the chef's knife can be used to perform various tasks. The best knives are made in Germany, mostly in Solingen, a charming town in North Rhine-Westphalia, known as the "City of Blades" (see photo below). Germany has a long tradition of making forged knives which goes back to the medieval times. The German knife manufacturers Wüsthof and Zwilling J. A. Henckels, probably the best known and among the most respected around the world, are both based in Solingen. They produce the best forged, high carbon stainless steel, full tang knives for all kitchen needs. These knives last a life time, and they usually come with lifetime warranties. We will compare below the Wüsthof and Zwilling J. A. Henckels knives. Note that J.A. Henckels also has an International line manufactured outside Germany (in China and other countries) which represents their lower-end products and are not of the same quality as the Zwilling knives which are always made in Germany (zwilling means twin in German). So, if you are going to buy J. A. Henckels and you want the best, make sure you choose from their Zwilling (Twin) product line. Most models are forged from a single piece of rust-resistant high carbon steel to ensure exceptional strength and durability. They are built with original handle designs for perfect balance, good control, total comfort, and effortless cutting. The handle and the blade come together in a seamless hygienic fit. The handles are made of a special very sturdy and durable synthetic material. They boast long-lasting extreme sharpness. Rockwell Hardness: Usually indentation hardness tests are applied to steel to determine hardness and resistance to deformation. The hardness of steel is measured on a scale called the Rockwell Scale. The larger the number on the scale, the harder and more resistant the steel. Most Wüsthof knives have a Rockwell Hardness value of 58, while most of the Zwilling J.A. Henckels knives have a value of 57. This means that the steel Wüsthof knives are made of slightly harder steel than the J.A. Henckels knives. Edge Angle: The smaller the edge angle on the blade is ground and honed, the sharper the knife becomes. The edge angle on all Wüsthof knives is 14, while it is 15 on most of the Zwillling J.A Henckel knives. Therefore, the Wüsthof knives are slightly sharper than the J.A. Henckels knives. Knife Structure: All Wüsthof knives are full tang and triple riveted. All Zwilling J.A.Henckels knives are full tang as well, but while some of their product lines have triple riveted knives, others use the Sintermetal Component Technology (SCT) which allows three different grades of steel to be combined to form a single piece, fusing together the blade, bolster, and tang. But, both methods produce extremely well built and durable knives. All Wüsthof knives except for the Gourmet line are forged. The Gourmet line knives are stamped. All Zwilling J.A. Henckels knives except for the Twin Signature line are forged. The Twin Signature line knives are stamped. The Wüsthof Classic Ikon and Grand Prix II knives are equipped with innovative and ergonomic handles for extra comfort and control, while the Wüsthof Classic and Gourmet knives have handles with a more traditional German design. As mentioned above, the Wüsthof Gourmet knives are the only ones that are not forged but stamped. Otherwise, all four Wüsthof product lines have the attributes listed above. as the Twin Signature line and the Twin Cuisine line of knives, but the three mentioned above are definitely the most popular and the most sought after. Note also that, as mentioned above, J.A. Henckels also has an International line manufactured outside Germany (in China and other countries) which represents their lower-end products and are not of the same quality as the Zwilling (Twin) knives which are always made in Germany. So, if you are going to buy J. A. Henckels and you want the best, make sure you choose from their Zwilling product line.